Miniature golf courses promising adventure and fun are everywhere, especially in the summer. But there are few courses that take the adventure aspect quite as seriously as Shipwrecked Mini Golf. 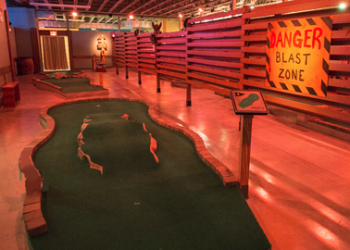 Located in Brooklyn's Red Hook neighborhood, New York City's only indoor miniature golf course features immersive scenery and a compelling storyline that together offer visitors an experience unlike any other. "We wanted to mix theater and mini golf together," explains co-owner Ryan Powers. Powers, along with longtime friend Chris Schneider, opened Shipwrecked in 2015. Both brought years of Broadway experience to the project, infusing Shipwrecked with a level of creativity and theatrics that is perhaps only possible in a city like New York. Powers and Schneider's extensive experience in scenic and audio design in the theater played a significant role in Shipwrecked's development. "We hand-built all of the scenery ourselves," Powers says. "Pretty much everything was hand-built by Chris and me. 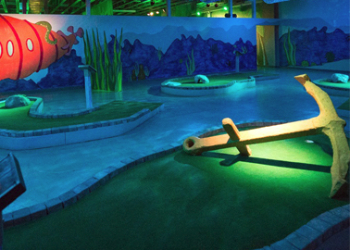 The course itself was salvaged from a mini golf course in Maryland that had gone out of business. We spent a year in Maryland digging it out of the ground and trucking it up here to Brooklyn." This experience contributed to more than just the scenery. "We spent a long time thinking about the themes and the story," Powers explains. "Ultimately, we decided on an adventure theme and we created different themed areas. But we needed to explain, for example, why you play the first holes underwater and then why the next holes are in the jungle, so we linked them together with a story. We took the ideas that we liked and mashed them together, then created a story that explained the different themed areas." Despite its relatively short time in business, Shipwrecked is quickly becoming a staple for locals and tourists alike of all ages. "The reception has been great," Powers says. "The majority of people who come here have a great time. We're very, very fortunate because we have a lot of repeat customers. Our job is to make sure that people have fun, and I encourage my employees to chat with people. Mini golf is just a universally fun thing to do." Ultimately, Shipwrecked offers a fun, authentic, and unique Brooklyn experience. "One of my favorite things is when I'm just sitting in the office doing mundane paperwork, and I can listen to the cheers and laughs of all the people having fun. We're not just a kid's place, by any means, but when you see a family with kids saying that they don't want to leave, that's so rewarding. We give people a chance to forget about all of the terrible stuff going on outside and just have a good time."